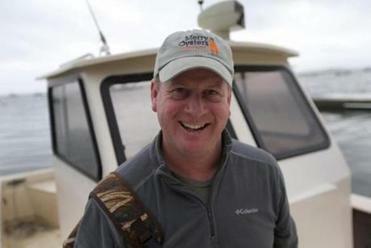 Don Merry’s oysters are again being harvested from his farm in Duxbury. Oyster harvesting is back on the South Shore after a monthlong ban that left local aquaculturists reeling from lost revenues at the end of the summer, and fans of the local shellfish longing for their return. 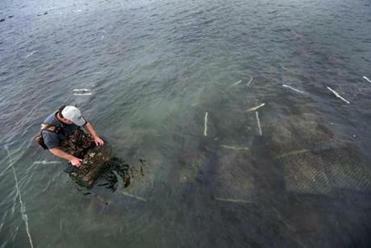 The state-ordered closure of oyster beds in Duxbury, Marshfield, Kingston, and Plymouth from Aug. 30 to Oct. 5 affected more than three dozen oysters farmers. After being shut off from local waters for several weeks, aquaculturists like Don Merry are glad to be harvesting mollusks again. “We’re happy to be selling oysters, and a lot of customers are happy because we’re back,” said Merry, who owns Merry Oysters, a Duxbury oyster farm that sells to Legal Sea Foods. Merry tends to three acres in Duxbury, where he grows oysters from seed the size of a pepper flake, and watches them grow to market size. On a good week, Merry harvested 10,000 oysters. With the ban lifted, Merry is not back up to 10,000 oysters a week — at least not yet. “We’re slowly getting there,” said Merry. State officials took drastic action Aug. 30 following reports of an outbreak of vibrio parahaemolyticus, a naturally occurring organism often found in oysters harvested from warmer waters. The bacterium, when ingested, can cause diarrhea, abdominal cramping, nausea, vomiting, fever, and chills, according to the federal Centers for Disease Control and Prevention. Three cases of vibrio illness were believed to be linked to oysters harvested south of Boston. All three of those people made a full recovery, and there were no more reported cases. Don Merry harvests oysters in Duxbury. But as a precaution, state officials banned commercial oyster harvesting in Plymouth Harbor, Kingston Bay, Duxbury Bay, Bluefish River, and Back River. They also ordered a recall of oysters harvested from those areas since July 22, which meant many wholesale and retail markets had to dump some of their stock. Oysters Bar and Grille, a Pembroke restaurant, wasn’t hit too hard by the ban, said owner Joe Emma. Emma said he got a credit for Plymouth and Duxbury oysters that he had to discard. The restaurant was able to get oysters from its other suppliers on the Cape, Canada, and Maine. “I had to destroy the oysters we had. They just asked us to discard them if we had any,” he said. It wasn’t the first time he had to deal with a ban. A similar thing happened a few months earlier with Blue Point oysters from Connecticut, he said. In such instances, restaurants simply turn to oysters from other locations. Still, losing the supply from a region like the South Shore reduces the options for oyster aficionados. There are at least 20 varieties of oysters harvested from the South Shore, explained Emma. His restaurant regularly carries Rocky Nook oysters from Kingston, Island Creek oysters from Duxbury, and Ichabod Flat oysters from Plymouth. Emma said oysters from northern waters are typically saltier, and those plucked from southern waters tend to be more meaty. Right now, he’s been relishing the Ichabod Flats. Two oyster fans at Emma’s restaurant are Tina and Chuck Parker, who eat there twice a month. Tina Parker, a Duxbury native who resides in East Bridgewater, has been eating raw oysters since she was a kid. She noted that Duxbury oysters are sweeter than other varieties. During the ban, she noticed that prices for local oysters went up at the supermarket. At her favorite restaurant, however, there was little change. Ben Lloyd, who owns an oyster farm in Duxbury and Pangea Shellfish and Seafood Co., a wholesaler based in Boston, said his business managed to survive during the ban. Although they’re glad to be harvesting again, many oyster growers wonder about the ban itself. “There’s a lot of questioning about why it happened in the first place,” said Lloyd. 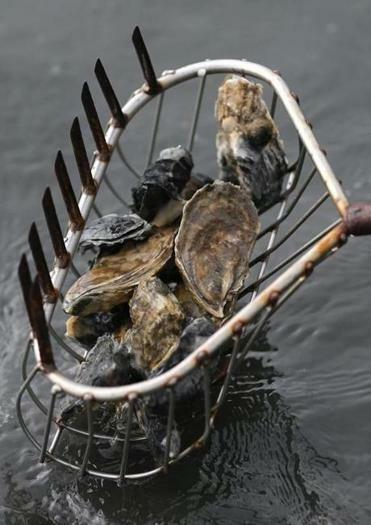 It was the first time Massachusetts closed specific oyster beds because of vibrio. After no new human cases of the illness surfaced and the water temperatures became colder, state officials ended the ban. The timing was tough, admitted Merry. “Actually, the timing of getting going again has been a little bit difficult, because typically fall is slower for restaurants and oysters in general,” said Merry. Merry said he’s trying to stay positive. “Being out of the market that long gives people a chance to miss us,” said Merry. Emily Sweeney can be reached at emily.sweeney@globe.com. Follow her on Twitter @emilysweeney.